In contrast to income levels, which economists find are correlated with race, subjective feelings of financial well-being don’t vary as much: whites’ average score in the CFPB survey was 56; blacks 52; and Hispanics 51. Two older age groups – all Americans over 65 and a separate category described as officially “retired” – have higher financial well-being scores than younger and working people. One possible explanation is that retirees today still enjoy the benefits from an earlier, golden age for retirement, when defined benefit pensions were more common and Social Security benefits were more generous. Indeed, the CFPB finding also showed that receipt of Social Security benefits is central to older Americans’ sense of well-being. Single people scored lower than married people, who tend to have more financial resources and often two incomes. That’s not surprising. But a new American Enterprise Institute (AEI) report underscores the importance of marriage status in undergirding the “class divide in American family life.” Less than 40 percent of working-class and poor Americans are married, compared with well over half of high-income people. The poor and working-class “have more fragile families and fewer socioeconomic resources,” AEI said. 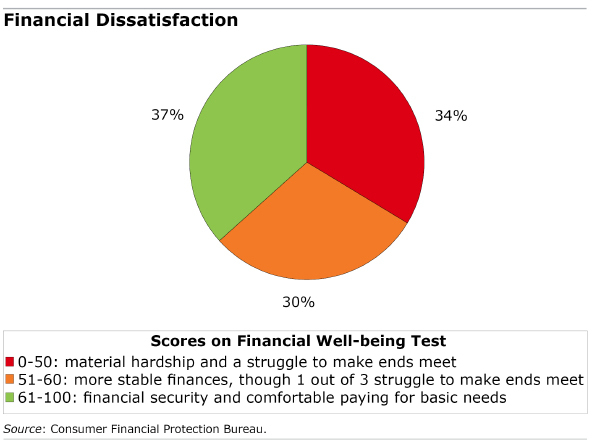 The greatest disparity between high and low well-being scores is tied to the amount people hold in bank and retirement savings accounts, CFPB said. The average well-being score is 41 for people who’ve saved less than $250 in these accounts, compared with 68 for people with more than $75,000. The ability to absorb unexpected expenses is fundamental to relieving financial anxiety. A national team of academic scholars and other experts (Garman et al. 2005) recently concluded that 30 million workers in America — one in four — are seriously financially distressed. Not only does this have negative consequences for individual workers, their families, and employers, but it also constitutes a serious social problem. The estimate of financial distress is based on findings from over 2 dozen research studies, national opinion polling data, and newly conducted research. Although most working adults are satisfied with their personal finances and are not financially distressed, a substantial minority is having considerable trouble. They worry about money, debt, bills, and having enough money to live on once they retire and have given up hope of catching up financially.